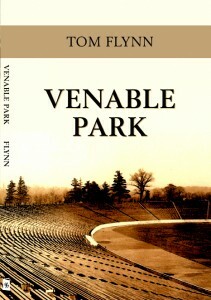 The Baltimore Post-Examiner is proud to present an excerpt from journalist and author Tom Flynn’s first novel Venable Park, This spring Loyola University Maryland’s Apprentice House republished Venable Park, a fictional story set in an entirely factual backdrop: 1920’s Prohibition Baltimore. The story is of ​Sparrows Point mill worker Henry Dawson struggling to find his bearings​ in the civilian world after returning from one of WWI’s most harrowing theaters, the Argonne Forest. On December 3, 1921, a football game was played on the campus of Johns Hopkins University in Baltimore pitting two unusual opponents against each other. The referees represented four different Ivy League schools, yet it wasn’t a college game. It was instead a match between two military teams: the Army’s Third Corps Area squad against a group of Quantico Marines. The crowd overwhelmed tiny Homewood Field as civic hot air filled the skies above it. Anyone willing to listen was told that this game, in just its second year, stood only behind the venerated ArmyNavy tilt as the most important military game of the season. Quantico prevailed 22-0, dealing a setback to young Army assistant coach Dwight D. Eisenhower in the process. As Baltimore Mayor Joseph Broening looked on from his seat at midfield, he reveled in the crowd’s enthusiasm for the game, and envisioned in the contest an opportunity to elevate his city’s national stature. In the weeks following the game, the mayor revived a civic notion adrift for a decade to build a major stadium in Baltimore and worked rapidly to make it a reality. It was proposed that the city’s Mt. Royal Reservoir, no longer used for drinking water, be drained and a football stadium with baseball potential fitted within its sunken confines. The revered former Baltimore Oriole manager Ned Hanlon lived in Mt. Royal, however, and sat on the Parks Board. He opposed the notion of 40,000 football fans in his neighborhood each fall weekend and proposed that the city’s larger Lake Clifton be drained and fitted with a bowl. En route to viewing Hanlon’s suggestion, members of the Board spied nearby Venable Park, a park in name only. It was in truth an old brick quarry turned trash dump, rapidly filling with the used ash cinders that 1921 Baltimore spewed out at a prolific rate. Why not put the stadium there? The cinders weren’t yet fully settled, and excavation could be done much more easily and quickly than at other locations. With the president of the Parks Board, J. Cookman Boyd, now backing Venable, it was chosen, passing both Mt. Royal and Lake Clifton. Ground was broken in early May and a stadium of Olympian stature was promised. What resulted instead was Venable Stadium, built cheaply and speedily in just seven months in 1922. A 40,000 seat horseshoe shaped bowl, it was erected substantially from dirt and wood with a modest concrete wall at its interior base (a classically-inspired façade would be added in 1923). The required upkeep of the stadium in future years would become legendary. On December 3, 1922, Venable Stadium opened to fanfare seldom seen in twentieth century Baltimore. Two members of the Cabinet and three governors were on hand, and a Marine sergeant called the play-by-play into a radio telephone linked directly to the White House. The Marines once again edged the Army, this time by a score of 13-12, and Baltimore was on its way to a future forged by toil, war, and ultimately, Venable. Venable Park is available online and ​locally at the Johns Hopkins Barnes and Noble on 33rd & St. Paul. Tom Flynn has contributed to the New York Times, Wall Street Journal, and Washington Post. He compiled the photo history, Baseball in Baltimore, in 2008 and has written one novel, Venable Park. Check out Tom's journal at boxerjournal.com	Contact the author.